Proper illumination goes a long way when working on a project, regardless of its nature. To ensure that you are not only getting the work done as quickly and efficiently as possible but also to help you organize your work for maximum efficiency. With the advent of LED lights, work lights have taken tremendous steps towards perfect illumination for worksites everywhere. It needs to be said, however, that not all work lights can be expected to meet the same operational standards and that some are definitely brighter, more adaptable, and easier to use than others. To help you make the right choice, we put together a list of the ten best work lights the market has to offer right now. A decent entry-level work light by most accounts the PowerSmith PWL110S 1080 Lumen LED Work Light which offers superior portability and brightness. With its 1080 Lumens, you can easily work in any environment, both indoors and outdoors. The light never requires changing and the LED lights are extremely durable. 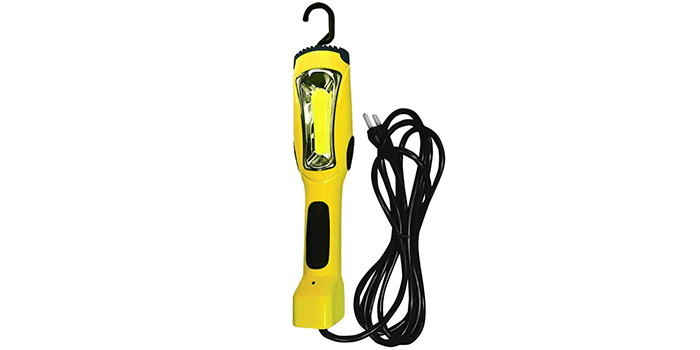 There is a large metal hook that can be used to attach the light to various surfaces and make work easier. The light head is completely adjustable and can be tilted 360 degrees while the power button is sealed which makes it ideal for outdoor use as well. 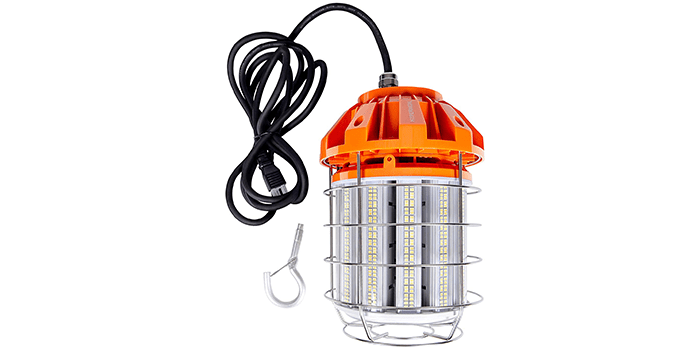 The Hyperikon 125W LED Temporary Work Light is a durable and powerful light fixture as it is protected against power surges and can easily bear sudden high voltage bursts. It has a total of 50,000 hours lifetime which makes it the perfect light to have in your workspace. The light can be used anywhere such as a garage, warehouse, loft, workshop, mine, construction site, or even a factory. The IP64 rating makes it dust and water resistant and ensures it can be used outdoors safely whereas its body is made from stainless steel which protects it from shocks and vibrations. 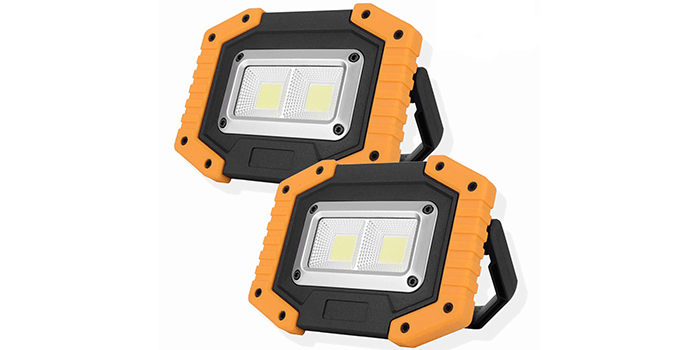 If you’re looking for an extremely bright, but portable work light, the LEONLITE High Bay LED Temporary Work Light Fixture is surely one to consider. It has a 10800-lumen power which needless to say, is guaranteed to produce intense brightness. It is also one of the most power efficient lights and can save you 89% of your electricity consumption. The light is portable and locks into place with an easy to use steel safety snap lock. It is extremely durable and is made from heavy gauge steel which keeps it safe even when dropped. At the same time, it is great at dispersing the heat and its IP64 rating means it can handle any weather situation. 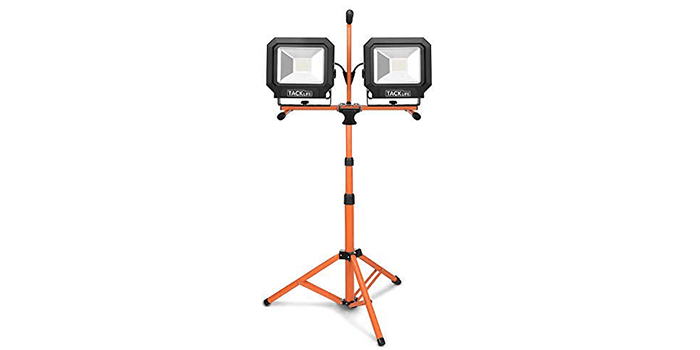 With the TackLife 10,000 Lumen Tripod LED Work Light, you get two 50W LED lights that produce a bright 10,000 Lumens of sheer power for easy working conditions anywhere. It also saves 80% of electricity consumption which is compared to an 800W halogen light. Portability is this lights most convenient feature as its tripod is easy to install and use. It is easy to mount on any surface and produces light at a 120-degree angle which reduces any shadow and glare. It can also be adjusted to 270 degrees vertically and 360 degrees on its axis while the IP65 rating makes it extremely weather resistant and keeps it safe when using it outdoors as well. With the OTYTY 2 COB 30W 1500LM LED Work Light, you not only get a bright environment to work better, but you also save 80% of your electricity consumption. 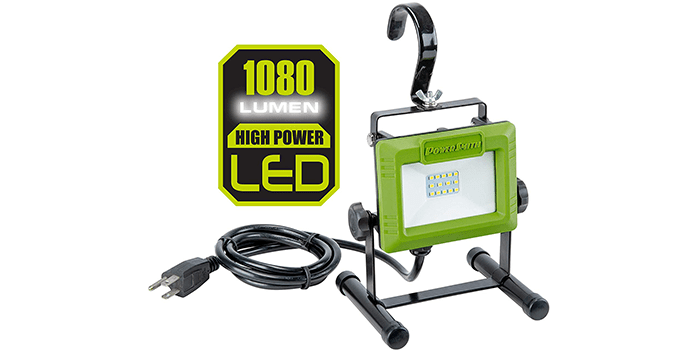 This portable handheld lighting system has a 30W COB LED arrangement that produces 1,500 lumens. The light has 3 different modes to choose from including a strobe light, high lighting, and low lighting. It also has an IP65 rating which makes it waterproof and makes it safe to use on rainy days as well. Thanks to its cordless feature, this light is extremely portable and can be used anywhere inside or outside. Powering the light can be done either with two 18650 lithium-Ion batteries or with four AA batteries. 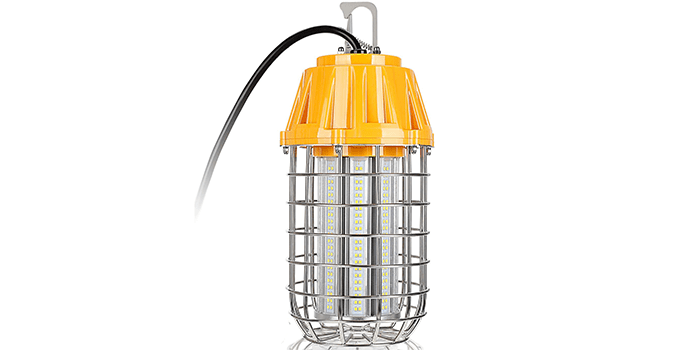 The 10W COB LED produces 1200 Lumens which lights up large spaces with relative ease. On the back of the light, there is a heavy-duty magnet which helps attach the light to any metal surface. There is also a 360-degree swivel hook which can be used to hang the light from different surfaces. Not just that but it also has an AC output on the handle for quick charging. Other important features include a power on indicator light, a 6-foot cable, and a non-slip handle. 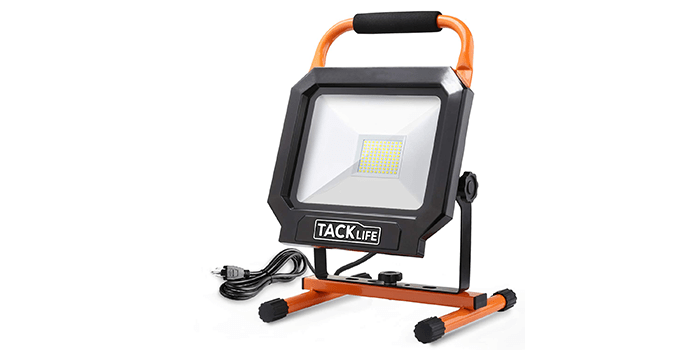 The TackLife 5000LM 50W LED Work Light is an extremely useful work light as it produces both intense brightness as well as a comfortable warmth as you work both indoors and outdoors. With 100 LED’s producing 5,000 Lumens of bright light, this work light can save up to 80% of your energy consumption when compared to regular halogen lights. The light is projected at a 120-degree angle which eliminates any shadowing. It can also rotate up to 270 degrees vertically and 360 degrees on its axis for a more precise lighting experience. Also worth mentioning is the large area of grooves or ribs on the back to quickly disperse any heat. 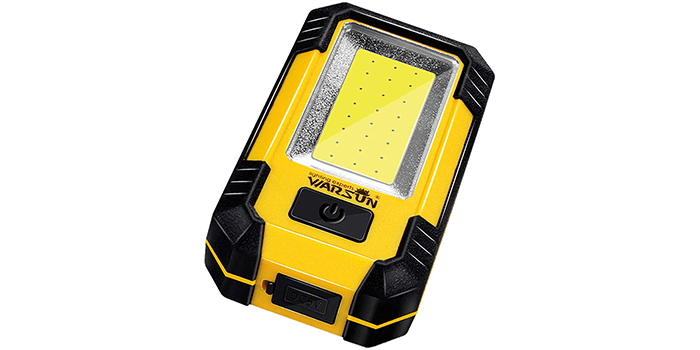 When it comes to portable work lights, the Warsun Portable LED Work Light stands out for a number of reasons. For starters, it has a 30W, 1200 Lumens COB LED light that is bright and saves electricity at the same time. It is also powered by a rechargeable 2000 mAh 18650 lithium-ion battery that can be used to charge other devices through a USB connection. The light is made from lightweight and durable aluminum alloy. The device also features 3 modes to use the light in, including high brightness, low brightness, and SOS flashlight. With a strong magnet on the back, the light can be attached to metal surfaces easily and its hook design makes it easy to hang on non-magnetic surfaces. 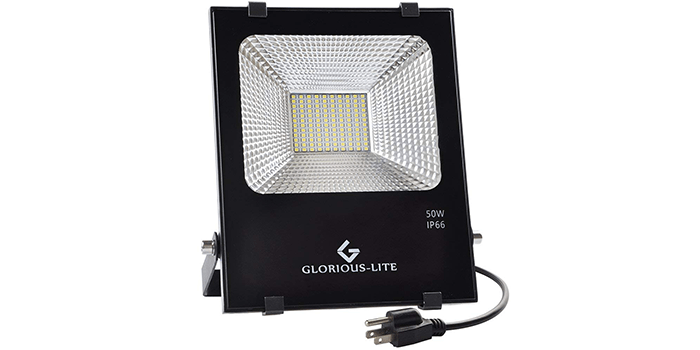 The Glorious-Lite LED Flood Light is a super bright work light that is extremely durable and practical by most standards. On the front, the light is protected by tempered glass which not only adds toughness but increases the amount of projected light as well. The light helps you save 80% of your electricity bill because it consumes a relatively lower amount as compared to regular fittings or halogen lights. The unique groove design on the back of the light allows air to flow over easily and keeps it cooler by dispersing the heat faster. With its IP66 rating, this light is perfect for outdoor use and can withstand dust and water quite effectively. 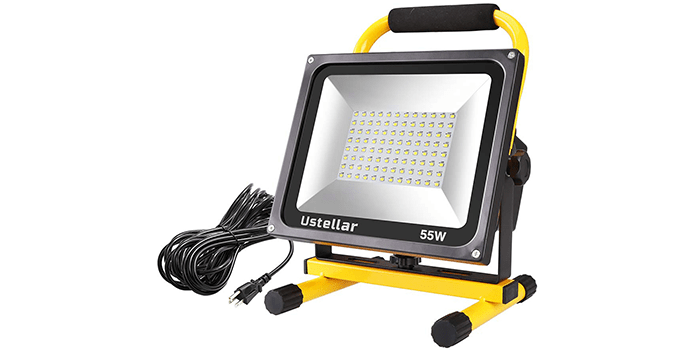 The Ustellar 5500 Lumens 55W LED Work Light is an easy-to-use light that comes with a 5-meter cord and plug that makes it easy to hang or mount almost anywhere. The device features two different levels of brightness with one level at 28W and the other at 55W. The light also saves 85% of your electricity consumption when compared to a regular 400W halogen light. With an IP65 rating, the light can be used indoors as well as outdoors and its adjustable knobs make tilting the light easier. 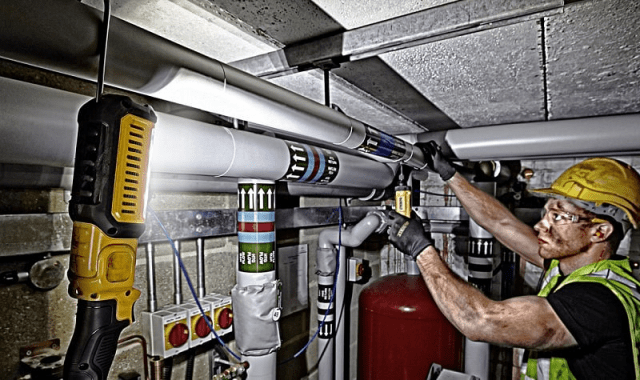 Furthermore, its ingenious design keeps the light cool and adds to the long life span of the LED lights, which is definitely something to consider when buying work lights of any kind.